Avail from us a wide range of Metal Pipes & Tubes sourced from the most reputed manufacturers. We ensure that only the best quality metals are used in the manufacturing of our Metal Pipes & Tubes. 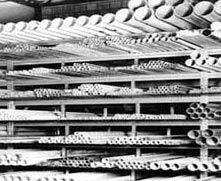 We offer our Metal Pipes & Tubes in different specifications suiting different industrial applications. We offer them in shapes ranging from round, square and rectangular in varying sizes and thickness. Stainless Steel ASTM A312 TP 304/ 304L/ 304H/ 316/ 316L/ 317/ 317L/ 321/ 310/ 347/904L/ etc. Carbon Steel ASTM A53 GR. B/ A106 GR. B/ API 5L GRADE B/ API 5L GR. X42/46/52/56/60/65/70 / A333 GR. 3/ GR. 6/ etc. Alloy Steel ASTM A335 GR. P1/ P5/ P9/ P11/ P22/ P91/ etc. Types Round , Square, Rectangular.